Grand Master of Librarians, Keeper of the Book of Salvation & Holder of the Keys. Ezekiel seen in a rare combat holo-vid record suited with a jump pack. This was taken soon after the injury at the Battle of Sularian Gates caused him to receive a bionic eye. Psychic Power: Ezekiel may use any two pychic powers listed in Codex Space Marines. Command Squad: Ezekiel may lead a Librarium command squad. 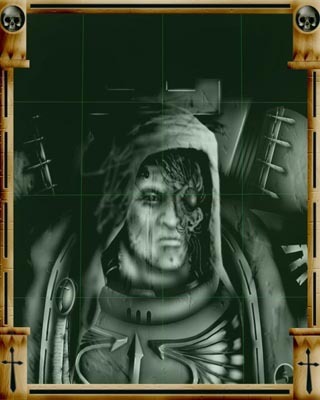 The chief librarians is amongst the wisest and talented of all space marine librarians and is a regular counsel of Azrael. The weight of the burden he carries are heavy but he has done so for many centuries.